A regional publisher has developed a new ‘eco-font’ which will be introduced at all titles published at its print centre and is thought to be the first of its kind in the country. A specialist team at Archant has created the new type of font, pictured close-up left,which reduces the amount of ink used by 10pc but which the company says does not affect the quality of printing. The initial idea for it was suggested by Paul Wheeler, a business analyst who works for the Archant Life section, and has now been developed by a team at its Thorpe Print Centre, near Norwich, using technology supplied by Kodak. Archant now plans to introduce the new font at the print centre, which publishes titles including the Eastern Daily Press and Norwich Evening News. Clive Want, senior production manager, said: “We have always printed black solid text using 100pc black ink but we have developed Paul’s idea and we intend to reduce all text to a 90pc screen. This does not affect quality in any way but it does save on ink. 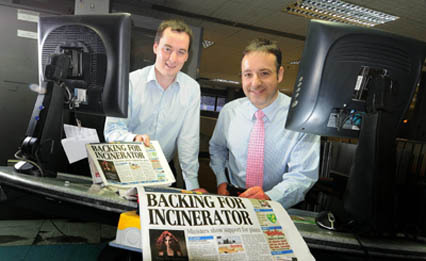 “Archant is the only newspaper company in this country capable of undertaking this because of its FM screen technology. Traditional newspaper AM screen technology would have resulted in fine text becoming grainy. 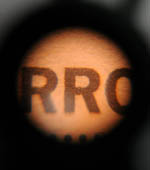 The process involves punching tiny holes, which are invisible without a magnifying glass, into the font and has gone through test stages using different variations of screen – with 90pc chosen as the most suitable option. Paul Wheeler and Clive Want discuss the new 90pc font. Nice idea… now how about saving paper as well and cutting out that huge right hand margin on the page? Thanks for the credits Archant…. NOT.